Hub on Wheels. It’s Boston’s Cycling Celebration, one big ol’ party for those of us who like to move on two wheels. It’s a yearly tradition in Boston, an event of pure optimism and a little bit of pluck, out to prove to fellow Bostonians and heck, ourselves, that Boston is a lovely city to explore on bike and that it IS and CAN BE ever-the-more bike-friendly. And the city shuts down Storrow Drive for us so we can bike allll over it — such a thrill! Me in 2007 – as you can see, I did not use a fancy bike! Best of all is that it’s a charity ride (not a race!). By biking in this fun event, you’re raising money for technology in under-served Boston schools. It’s a great cause. When Hub on Wheels started in 2005 it was pretty small event. People thought the whole concept of biking in Boston was nuts. When I started participating in Hub on Wheels in 2007, it was in its third year and every year it kept breaking records for registration. 2007 it passed 3000 participants. This year, 2011, I heard we passed 7000 registrants — WOW. I’ve been doing this ride for five years now, so I thought I’d lend a little bit of wisdom from my experiences to people who are new. Hub on Wheels has its own FAQ but here are my tips that go beyond the basics. 1) Be aware of traffic. With the exception of Storrow Drive, none of the roads on the route are closed from car traffic. Great thing about Hub on Wheels is with so many bikes, WE ARE traffic. There are lots of police, troopers, crossing guards and volunteers who will stop car traffic to make sure you can pass safely at major intersections. But they’re not at EVERY intersection along the route. That means if you’re coming up on a red light, unless there’s an officer directing you to go, make sure you stop. You might hear people shouting “car up” or “car back” — this means “there’s a car coming at us” or “there’s a car coming behind us.” In other words, move over to the right if you’re in the middle of the road. Do your part by amplifying the message — repeat it/shout it so other cyclists around you know as well and you can all stay safe. Traffic means other bikes, too! Given the lack of brake lights on bikes (haha), if there’s a sudden slow down at a choke point, help out other cyclists by announcing a sudden stop (shout something like “slowing down” or “stopping”) — this can be very handy at some of the more narrow bits of the ride towards the end after the JFK library and along the waterfront. This is not required of course, but it’s nice bike etiquette — especially if it’s a gorgeous day and people are not really paying attention to someone’s squeaking brakes. Shouting a clear “on your left” as you pass other cyclists is also good basic biking etiquette. Personally I say go easy on this one for Hub on Wheels, given the amount of cyclists, someone is always on your left or right passing, so you don’t need to say it constantly. But if you’re going around someone who’s wobbly, or if you’re passing in a tight area or a curve, definitely let people know. 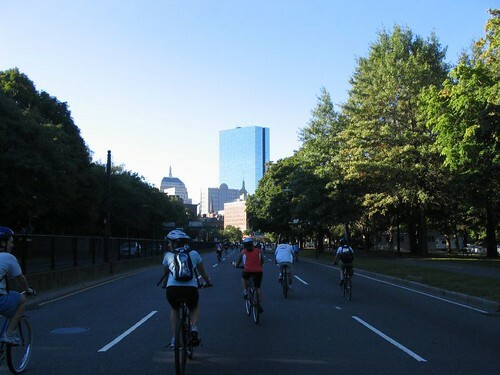 The start of the ride is a big downhill and then lots of flat terrain (a lovely car-free Storrow drive). This can be a little deceptive for greener bike riders, as you might blow your pacing at this point and overdo it. If you’re a little out of shape or not exactly bike-ready, pace yourself here. I know it’s tempting to go WEEEEEEEEEEEEEEEEEEEEEEEEEEEE — okay, and you should!! — but remember that this is only the first 7 miles of the route! If you’re doing the 30 or 50 mile route, don’t blow all your energy here, there are some ‘fun’ hills ahead. With 7000 people riding in 2011 — that is a lot of folks on bikes. All it takes is one wobbly rider and you can potentially cause a big pile-up. If you’re hurting, winded, or are getting tired, or need to stop for whatever reason, please be safe when you’re walking up a hill or pulling over. Chances are there’s someone trying to get around you. Pull over to the right, just like you would in a car, and make sure you’re clear of the main thoroughfare. Do not stop in the middle of the road and block other cyclists. A disaster waiting to happen right there. If you’re going to use an iPod to listen to music to keep you going — not something I recommend but I recognize people will still do this — keep at least one earbud out. Please. You are biking in an incredibly dense and often compact group of people and you need to know what’s going on around you at all times, especially if someone’s trying to tell you that you dropped something, a car is coming, et cetera. This hopefully goes without saying, but make sure to shout a thank you to the officers and volunteers as you fly past. They’re standing out there for hours in variable weather and dealing with potentially irate car drivers, all so you can have a good SAFE time. Give back some good karma and help out the reputation of Boston cyclists — say thanks, wave. The volunteers are often young kids with tons of enthusiasm, give them a thanks and a high five for their help; their cheers and encouragement always push me forward. Bare necessities/portapotties aside, each rest stop has free food and water to help you refuel AND some basic bike triaging. They’re not going to give you a full bike tuneup if yours has been in the garage untouched for a few years (make sure you get that done before the ride) but if you need some more air in your tires, or if something’s making a funny noise, they can help you out. The 30 and 50 mile ride are not the same as hopping down the street to do an errand. If you’ve never done a ride of this length, MAKE SURE YOU DRINK PLENTY OF WATER AND EAT. You are not a camel! As fun as the ride is, it’s a workout. That’s why there are rest stops — they’ll have fruit, bagels, energy bars, fig newtons. Even if you’re only doing the 10 mile, get your bike checked out if you haven’t had it looked at recently. I saw someone with a flat barely 1 mile into the ride, which is a serious bummer. As mentioned above, the rest stops will give basic triaging help with your ride but it is YOUR responsibility that your bike is in rideable condition, for your own safety and for the safety of others. Tuneups are quick and honestly not expensive, just get it done! You’ll have a much easier time on a properly tuned bike. 5) Remember it’s a CHARITY RIDE and not a race. Have fun! This event is about doing good and being part of a big, vibrant community. It’s a ride and not a race — I can’t say that enough because some people get uber-competitive and forget. (In other words, if you try to blitzkrieg your way through Storrow Drive, you’re doing it wrong.) Just let those guys pass you by and enjoy your time on the ride. Every year I see folks rocking new ideas to bring a sense of fun and humor to this ride, and I love it. Runners in charity races have been doing/wearing funny things in their events, why shouldn’t cyclists? So wear a funny jersey, get an adorable bike bell and just ring it for the heck of it. Give words of encouragement to people who look a little drained (trust me, I really appreciate it when I’ve been on the receiving end of this). Cheer on the little kids who are keeping pace with their parents. If you can, go with at least one other person. It’s a lot more fun that way (though I’ve enjoyed biking it solo as well). A lot of people go in groups and it is a fabulous way to keep each other motivated. Smell the roses, as they say. There are some places where people pull over and take group photos — I’m thinking specifically the waterfront area by the JFK library with a fantastic skyline view. You really don’t want to just blast through the route. Really enjoy the beautiful neighborhoods you’re exploring, take your time, take photos if you like (safely! ), and heck, maybe stop in at a brewery or pub for a drink if you’re so inclined, as we do pass quite a few of them towards the end. The enthusiastic spirit of the Boston cycling community makes me come back to this event year after year. No matter your skill level, Hub on Wheels is not something you should miss if you like to bike. Late September is almost always gorgeous weather in Boston and the city puts together a fantastic event with generous sponsors and tireless volunteers. Don’t miss out on the next Hub on Wheels! What’d I miss, guys? Let me know in the comments! Starting line: Given the crowds at the starting line, pay attention to directions from staff/volunteers. If they’re telling you NOT to go, that’s because it’s still congested up ahead and they’re waiting for the crowd to thin. PLEASE listen to the staff and respect their decision to stagger the line. It’s no fun biking in a pack of thousands at 5 miles an hour, let the crowd thin a bit. Starting line crowd down Court Street. Miles 0-9: This takes you along a car-less Storrow Drive — enjoy the heck out of this! At the 4 mile mark there’s a turnaround (clearly marked, don’t worry). Make sure you slow down and give yourself plenty of clearance to turn. As you finish the Storrow Drive mark, the 10 mile route split is coming up in the Fens — again, the staff will let you know where the split is. If you’re feeling tired and don’t think you can do another 20+ miles, finish up by doing the 10 mile route. There’s no shame in it! Remember, the route only gets more challenging from here, so don’t kill yourself if you are not feeling up for it. Miles 9-14: Through the JP area. This will be your first time encountering car traffic, a bit disconcerting after a car-free Storrow! There will be cops at most intersections but not all, so make sure you STOP if there’s a red light. There are also a few hills in this section, a bit of a warmup for the section to come, so pace yourself here. At around mile 14 there’s a rest stop. This is the first one you’ll encounter — refuel, refresh, et cetera. Take it easy. The next section is the hardest so make sure you are ready for it! At the Arboretum stop. Feeling a little cheeky but somewhat dreading the hills ahead. The 50 mile route splits from the 30 at this point, so make sure you are going in the right direction. Listen for directions from the staff, watch for the signs. Miles 14-18: The roughest part of the 30 mile route because of some hills. As you’re going through the Arboretum there’s a pretty challenging hill (the lilac way hill I believe it is?). It’s a big hill, so pace yourself and gear for it properly. And if you need to walk it — many people do — make sure you pull over to the right. Catch your breath and steel yourself for about 3 or 4 more hills in the Forest Hills cemetery. They are short hills but they are VERY suddenly steep, and given the crowds (and the turns on these hills) it can be hard to get a running start on them. Give yourself and other cyclists plenty of space here. Know that after just a few of these hills, there’s a rest stop — the Forest Hills rest stop. Trust me when I say a lot of people linger to catch their breath here, so don’t feel bad if you need to as well. Again, remember to refuel! The 50 mile route merges back with the 30 here, so a lot of people hang around to wait for their friends here. It’s also a beautiful rest stop with a bell tower, gothic gate and lovely flowers, so enjoy! PROUD that I killed those hills, but also sweaty as heck. If you heard someone going “I freaking hate these hills!! !” in the Forest Hills area this year, that was me. Miles 18-21: You’ll be looping around the back of the Devine golf course, at one point going through an active parking lot (watch out for cars pulling in or reversing out!) and a few really tight choke points around closed gates and such. Be aware of your surroundings here. Once you’re back on the street, you’ll be going through some really lovely Dorchester neighborhoods, a lot of folks will be out on their porches cheering you on. You’ll also pass at least 2 churches, and if you’re lucky you’ll hear some gorgeous singing wafting out the open doors and down the street to greet you. Codman square stop. Happy times, happy faces — awesome music always helps. Miles 21-26: Pretty smooth sailing here, make sure you follow the signs (not as many volunteers in this area so some people get confused where the route goes). You will actually get on Morrissey Boulevard (!!) at one point — don’t worry, police officers close off a lane exclusively for cyclists so you don’t have to worry about cars buzzing past you at close range. That said, there is one potentially treacherous where it bridges over the water and the bridge is made of really nasty-looking tire-munching shredded grating. That stuff will eat your tube and tire for breakfast, with malice and delight. Very thankfully the event organizers have some green carpeting they put over a narrow strip of the grating. MAKE SURE you bike on this carpeting, your wheels and tires will thank you! Soon you’ll turn to the waterfront walkway around the UMass Boston campus. This is narrow (and bumpy) and often there are people out for a walk, fishing, and many cyclists take a break on the benches to take photos. Slow down — you can’t blast through this area (and if you try, you’re a jerk). Mile 24 is Harborpoint Park at the JFK library. This is an unofficial rest stop for the ride, as it provides a beautiful skyline view of Boston. Pull over and get a group shot here! You’ll also be going on some park sidewalks here, and they can get quite narrow. Some nasty chokepoints here, so be aware of bikers in front of you. Again, not in your best interest to blast through this section, or even pass other people in my opinion. Just keep pace and hang tight until we get to Carson beach. You will also go behind the Bayside Expo Center in one of my least favorite parts of the route, only because it’s loose dirt and a sudden but tiny hill. Because it’s loose dirt, you need to have enough speed to stay stable here. If you don’t have enough speed here, likely because it’s crowded, it can be really annoying (doubly so on a road bike). Unfortunately there’s no other way to get around this area, but I still don’t like it. Some people just hop off, walk up their bikes a few steps, and hop back on. Not a bad idea if it’s crowded, honestly. Mile 26 (ish) is the Carson Beach rest stop — my favorite because you know you’re in the home stretch. Lots of bathrooms here, take a moment to sit, stretch and relax. At this point you are just a handful of miles to the finish line! Miles 26-30: You’ll be going through Southie now, either on the sidewalk or the road (you choose). Smooth sailing here. Then you head up through the Waterfront district, which for some reason tends to have a robust headwind. Woo! But, serious bonus, there are usually NO cars here so you feel like you have the road to yourself. And you kind of do! You’ll pull off the Seaport/Waterfront area road right to and around ICA (watch out for tourists!) and then around the Courthouse (watch out for tourists, dogs, cobblestones, judges?). Navigate here carefully, there are some very sharp turns here. At this point, it’s the homestretch! Follow Atlantic ave (lots of cars here, be careful) and then turn onto State street, up to Government center and the finish line. Hooray, you did it! Go get a beer, burrito, some Redbones — or go home, if you need a nap (as I often do). a special thanks to my cycling-obsessed boyfriend Eric who contributed some ideas for this blog post too!